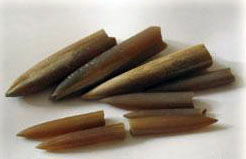 Belemnites is fully extinct detachment of Cephalopodas of shellfishes. Sometimes their shells name "devil finger". Family modern octopuses, cuttle-fish and squid, possessed a powerful internal shell - rostrum. For modern squid and cuttle-fish an internal shell reducing to the thin plates, and at Belemnites this was exactly a shell, thus enough powerful. Exactly rostrum you can see on pictures. Rostr of Belemnite was on the end of soft body and served as a ballast in order that an animal was not inverted and did not wag during motion (rapid jet propulsion was carried out a back-end forward due to throwing out of water). On some rostrums it is possible to consider the imprints of blood vessels, that proves their internal location in the body of shellfish. Time of distribution is Cretaceous period - swept. Active predators. Judging to on the amount of rostrum in jurassic layers, they conducted the way of life, look like the way of life of modern squid - floated enormous coveys, consisting of individuals of one size and century. As well as ammonites, mainly they did not outlive the epoch of extinction at the end of mesozoic. Although, one of not numerous sorts of Belemnites lived as early as a paleogene, but it already there were obviously the last representatives of detachment. Belemnites is not so beautiful, as ammonites, and their rostrum little differ from each other. A size of rostrum is from 0,5 to 15 centimetres. They meet in jurassic clays together with ammonites, but better saved due to greater durability. Sometimes on rostrums tracks of boring and eating away of detritophages are visible, means rostrum long lay on a day and some ground animals he was populated slowly. 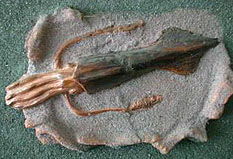 Belemnite. In common speech he is named a devil finger, thunder arrow, immediately from lightning. Behaves to the "ink finfishess" - dibranchiate Cephalopodas to shellfishes of cephalopoda. Very widely widespread in jurassic and chalky periods. Cone-shaped sharp lime rostrum is solid back extremity of "ink fish". Meeting in large accumulations in the mine deposits of jurassic and chalky periods, Belemnites partly are rockforming organisms. Rostry, as a rule, is badly distinguished between itself, so that exact specific determination of Belemnites is ordinary difficultly. On rostrum there is a weak longitudinal furrow, not arriving at his end is characteristically distinguishes Belemnites from other educations. On a photo the found is down presented in sand of gravel rostrum of Belemnites. These Belemnites have a sedimentary origin. In the beginning rostrum accumulated on the day of primitive Maureies and oceans of jurassic and chalky periods, when Belemnites were extraordinarily widespread. 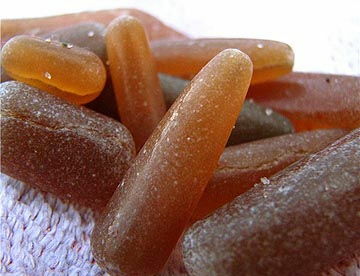 Rostry of Belemnites was made more a compact in future, covered the layers of other siltages and silt, exposed to the rockforming changes, after they placed went out on a surface. If rostrum accumulated in great numbers and strongly modified, them can be sufficient it is difficult to dissociate from each other - they form continuous sedimentary rocks arrays. Wherein rostrum of Belemnites was not blown away and are in the layer of maternal rock and dissociated from each other, they were very well saved and have a characteristic form, rotined higher. 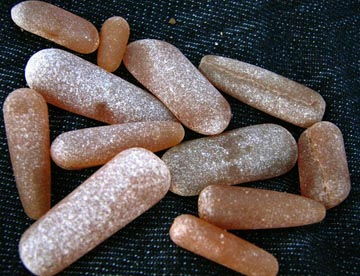 If Belemnites in a rock was exposed to weathering (rocks were washed out the rivers and seas), rostrum appeared balled material of the water, carried elsewhere and purchased the characteristic smoothed out configurations. Sharp edges and sharp tag disappeared, in a characteristic longitudinal furrow is many cases worn away even. Water mechanically pranged and carried Belemnites into new place, more frequent than all in the accumulations of sand and other similar material of sedimentary deposit origin. Hard wreckages acquire characteristic balled already through a 10-20 km of transfer on the active river (for more quiet rivers a greater mileage is required). One wreckages scratch other and pour each other. Here and they are saved on the banks of the rivers, where a flow is slowed by the motion, the masses of kimberlite balled, got from rostrum of primitive Belemnites. Actually, takes a place the same with them, what with marine or river pebble. To the river and seas however, that to pour are stone, Belemnites or fragments of glass. 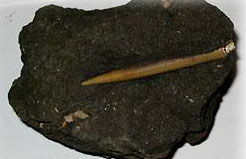 Belemnites on the banks of the rivers is efflorescent siltages. It is a not result of melting of sand at a hit in him of lightning - fulgurite, because the last rather remind tektites (results of shots of meteorites at sandy earth) and have more wrong form. Also a characteristic for Belemnites longitudinal furrow absents along rostrum.